The end of the financial year is upon us and fervent calls to chartered accountants and tax planners are bound to me made. If you want to avoid calling your accountant for knowing a few quick answers, put your Android smartphone to good use and download some of these tax calculating apps that will help you know your tax status by simply plugging in a few numbers. 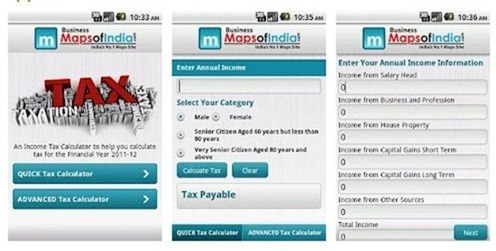 And yes, these Android Tax Calculating Apps are completely free, so if you are an android user give them a try! Think Tax still hasn’t attained much maturity on Android Market so it would be difficult to say how popular and effective it really is. You can key in details like your salary, investments, savings etc. and the app will tell you how much tax liability you have. Useful features of this app include being able to save your results and share them with others. 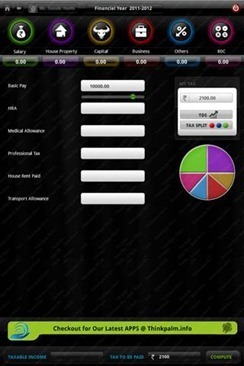 The app also gives links to pay tax online and e-filing. User reviews have praised this app for having a great UI. 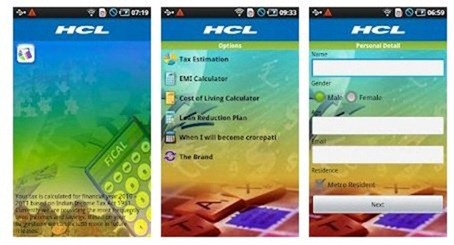 FiCal is a recently released product of HCL Technologies which allows you to come up with a range of tax calculations by simply entering details of your personal income and savings. To know the status of your interest payments and EMIs on loans, use FiCal’s EMI Calculator. In addition, the useful Loan reduction plan in FiCal will help you to find the number of payments to be made to write off your loan. Based on your current expenses, you can calculate your cost of living after a certain year. A very interesting feature of this Android app is that it has a Crorepati planner, which means that if you want to become a crorepati by a certain age, then you simply plug in your numbers and FiCal will help you plan your finances to reach the goal. If you want to work out your tax splits and how much you need to invest to save a certain amount from your income, My Tax India will be your suited assistant. You can also export your tax details in your email, share it with other users and enable multiple user entries through this app. Users have praised the innovative use of graphics in the app – every result is converted into a visual graph so that comparison and understanding of numbers becomes extremely easy for an average reader. Give them a try and let us know what you feel! Recently i have been hearing a lot about this cheapest capacitive 1.5 GHz Android 4.0 Xtab A10 @ Rs 5490 by NXG Electronics. Can you please suggest whether i should book an order for the same as i am really new to the tablet world.